At first glance, the power struggle currently taking place among Iran's ruling elites might seem bizarre. After all, it is not often that the chief executive of a 21st-century nation is accused of "witchcraft," "experimenting with exorcism" and "communicating with genies." Mullahs have tarred Iranian President Mahmoud Ahmadinejad's administration as containing "deviants, devils and evil spirits." 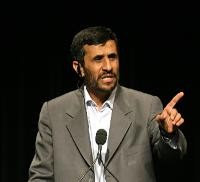 Ahmadinejad responded that his opponents have launched a "conspiracy" to undo socio-economic changes beneficial to most Iranians.